You will appreciate stylist Maudi Martin-Gourdin! Maudi is a native born Tucsonan too! She received her initial training at the Arizona Academy of Beauty and then continued her training at Vidal Sassoon in Santa Monica, California. Maudi has been at the TRFC for over a decade. She is a color specialist with 20 years of experience and has had experience working on TV and stage sets as well as sets for music videos. Contact Maudi on her cell 235-6723 or email trchairstudio@gmail.com. Meet stylist Philip S. Ponce! Born in Galesburg, Illinois west of Chicago. Graduated from Galesburg High School in 1971. Philip attended the Lincoln College of Barbering in East Moline, Illinois and in 1975, following a 27 month apprenticeship he became a registered master barber. He is also a graduate from the Sterling School of Cosmetology. Philip with over 40 years of experience is licensed in Illinois, New York and Arizona. Please call 327-0147 and leave a message. Amy Wagner is a native born Tucsonan! Amy is a graduate of Allure Career College of Beauty. 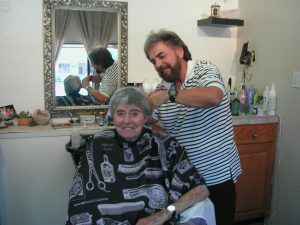 She is a Arizona licensed hairstylist and has been serving the metro Tucson area for over 20 years. She specializes in highlighting, coloring, brow shaping and more. For personalized hair services, please call 512-8067. Let Amy help you create a hairstyle…..to fit your busy lifestyle!